Click on links below to register for the individual races. 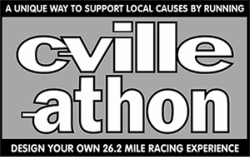 Use hashtag #cvilleathon when you post your progress and photos on social media. Sponsored by Ragged Mountain Running & Walking Shop, Charlottesville Track Club, and C-VILLE Weekly. Sponsored by Ragged Mountain Running & Walking Shop, Charlottesville Track Club, & C-VILLE Weekly.